Dutton Books for Young Readers, 9781101994979, 336pp. E. K. Johnston is the #1 New York Times bestselling author of several YA novels, including the L.A. Time Book Prize finalist The Story of Owen and Star Wars: Ahsoka. Her novel A Thousand Nights was shortlisted for The Governor General's Award. The New York Times called The Story of Owen “a clever first step in the career of a novelist who, like her troubadour heroine, has many more songs to sing" and in its review of Exit, Pursued by a Bear, The Globe & Mail called Johnston "the Meryl Streep of YA," with "limitless range." E. K. Johnston lives in Stratford, Ontario. Follow her on Twitter at @ek_johnston. "This is one of those books you throw at people with no explanation, because you know that they’ve never read anything like it, and you want to share the beauty. "—Rachel Strolle, Anderson's Bookshop, Naperville, IL. "This delightful light sci-fi novel is just the thing for anyone and everyone who might enjoy Anne of Green Gables if only it were more inclusive and updated for the 21st century. "—Angela Whited, The Red Balloon Bookshop, St. Paul, MN. 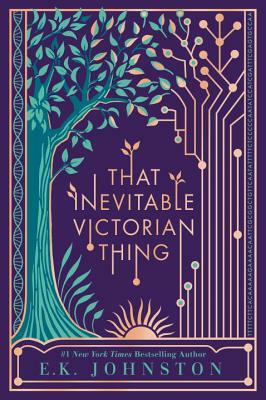 "Everyone knows (or should know) Johnston is a master of every genre she puts her hand to, and That Inevitable Victorian Thing is no different. Original, warm, humorous, and with real depth. Love it. "—Allison Senecal, Old Firehouse Books, Fort Collins, CO.